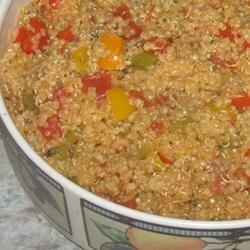 "This colorful quinoa dish is easy to cook, and my toddler loves it!" Heat the oil in a large skillet over medium-high heat. Add the onions and red, green and yellow peppers; cook and stir for about 5 minutes. Add the garlic, and cook for about 2 more minutes. Stir in the quinoa, vegetable stock, and tomato puree. Return to a boil, then cover and simmer over low heat for 20 minutes, or until quinoa grains are soft. Stir in the diced tomatoes and season with Italian seasoning. Cook until heated through, then serve. This was delicious! I used 1 cup quinoa and 2 cups of homemade turkey broth to make it less soupy. This would get 5 stars from me if the liquid was adjusted to 2 cups so it wasn't so soggy. Still, we ate it all and my teen son even went back for seconds. I whole heartedly agree with the other reviewers regarding the soupiness. This would have 4 stars had I cut down the broth-quinoa ratio. Definately omit 2 cups of water. Soooo good and even better the next day for lunch. Even my roommate liked it and he's super picky. This recipe taste good but it was to watery. I followed the exact recipe but I expected it to come out like rice where the liquid is absorbed into the quinoa. I'll try less stock next time.